Since I have now given this gift, I can post pictures of it. I made this baby set for my cousin Melissa’s baby, Jesse Jr. He will be here in about a month (maybe less). Melissa loves western and cowboy things, so when I saw this Michael Miller cowpoke fabric, I had to have it for her! The set includes a hooter hider, a buttie, a burpie, and a diaper clutch. I designed the diaper clutch myself, although I am not thinking it really takes a genius to do it. 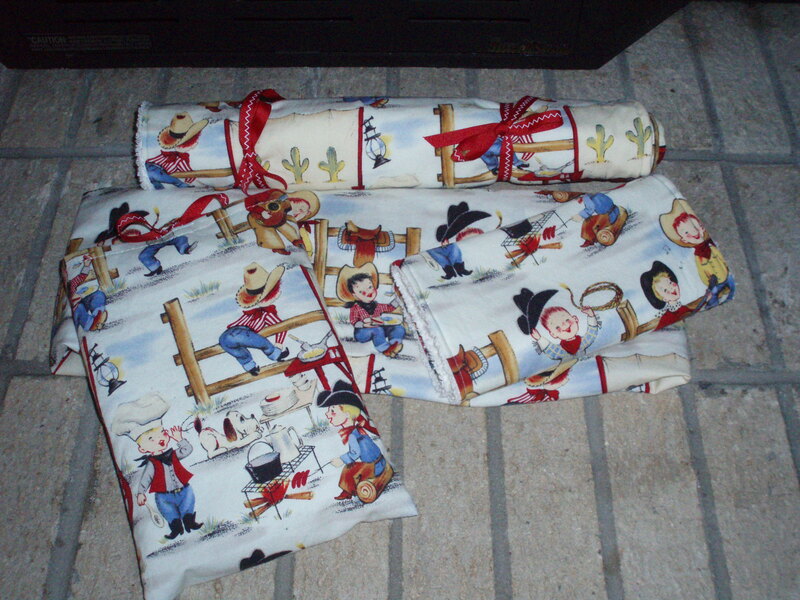 I put this set in a basket with a pack of diapers, a pack of wipes, and a few little toys and things that were western! I think JJ will be the cutest little cowboy around! Want to know how to make this simple diaper clutch? It is very easy! I took a plastic travel wipes container and measured it. They are about 8″ by 5.25″. I cut a strip of fabric 18″ by 6.5″ (making sure my fabric was going the correct way- no sideways cowboys). I hemmed each small end first (the parts the become the top and bottom.). (Just fold, press, fold, press, and sew!) Fold the strip in half (into the shape of the clutch) with right sides together. Sew the long edges together. Flip it inside out and you have your clutch. To close your clutch you can do whatever you like. I sewed ribbon ties in so it would match my ribbon tied buttie. You can also do snaps, velcro, buttons, or leave it without a closure. This super simple way to make a diaper clutch will make the reverse side upside down. That didn’t really bother me. If it bothers you, you can cut two 9.25″ by 6.5″ rectangles and sew the bottoms together so each side is right side up. This clutch is big enough for travel wipes, a couple diapers, and a tube of diaper ointment. I found you in the tag browser a little while ago. I’m in Mississippi, too…bless both our hearts. 🙂 Where did you find the instructions for making the hootie? I make them, too. 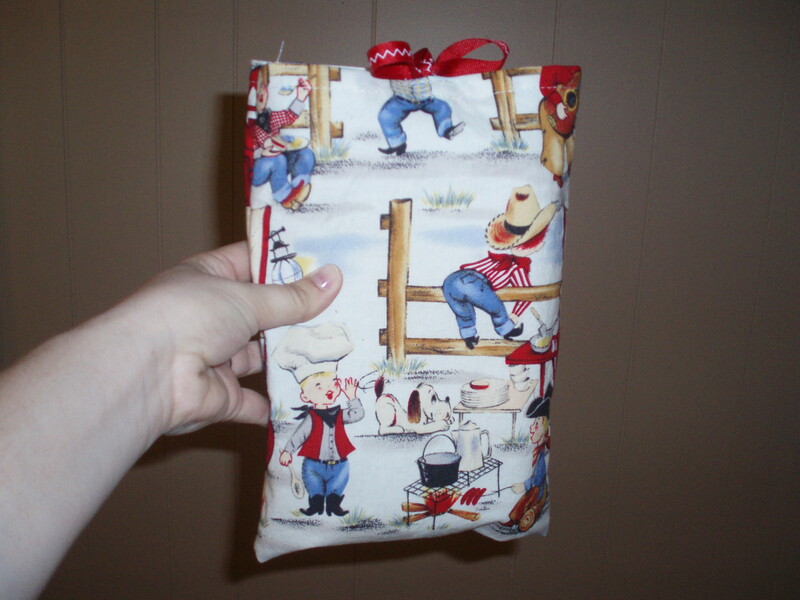 I had never seen a diaper clutch before…cute idea. I just might make one for the next baby gift set I make.